Not only are these chocolate slice cookies delicious, but they look beautiful, too! 1. Beat the butter and icing sugar until smooth, then add the egg yolks all at once and beat until well combined. 2. In a separate bowl, sift the flour, cocoa powder, cornstarch and salt. Add this to the butter mixture and stir until evenly combined. Shape the dough into a log about 2 inches in diameter, wrap and chill until ready to use. 3. 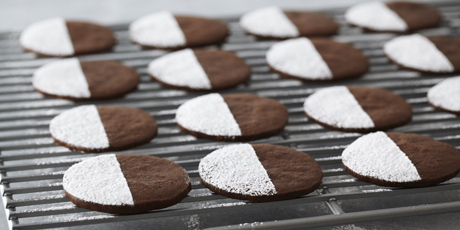 For icebox cookies, preheat oven to 325 F. Line 2 baking trays with parchment paper. 4. Cut the dough into slices about 1/8-inch thick and arrange them on the prepared baking trays. Bake for about 12 minutes, until they are no longer shiny. Once cooled, dust the cookies with icing sugar. 5. The cookies will keep in an airtight container for up to 4 days.